Companionship Unity - Rivalry Week P-day Attire! Another Week in the CCM! It´s been quite an eventful week this week so I´ll just jump right into it. Me and mi compañero´s Spanish have been improving a lot! We now have two practice investigators to teach and our lessons are getting a lot better. It´s really neat to see the power of the Holy Ghost guide our thoughts and help us to know what our investigators need to hear! As a district we made a goal this week to eat with a group of Latinos for one meal a day. It has been a blast! We made friends with this one group of elders and its great to practice our Español with them. They are really funny too haha. Today they were taking pics at breakfast and me and my companion offered to take one for them and they all when crazy! All ten of them handed us their cameras and then they each wanted a pic with us individually and we ended up taking pictures for like 20 minutes ha! They are really funny and so fun to hang with. Just a few hours ago I was finally able to meet up with my friend from Boise, Elder Millington! It was fun to talk to him and ask him how his first day was and tell him the ins and outs of the CCM. And what's really awesome is we are in the same zone! So his class room is right next to mine so we will definitely have some fun together the next three weeks! Our district is pretty sad this week because we made friends with another district in our branch and they left this week! We would play volleyball and ultimate frisbee during gym time everyday and it was a blast! It´s crazy how fast the weeks go by in the CCM, next week we will already be the oldest missionaries here! So me and Elder Watson have a pretty great relationship with each other. He is a really funny guy and easy to get along with and i´m so glad I have been blessed with a great companion! All week this week we have been teasing each other on who will win the football game between Boise State and BYU. And he´s from Provo so he is a die-hard cougars fan lol. So we made a deal with each other that whoever´s team lost, they had to buy them a frozen twix bar from the tienda. So we waited all week for a letter to come telling us the score. And it finally arrived on Tuesday! So after gym we went to the post office with our district leaders and once we saw the letter we were so excited, we were like THE SCORE IS HEREEEE and we tore it open as fast as we could haha. And the Broncos won by one point!! I was celebrating like mad hahaha. And my companion kept his word and bought me a twix bar lol. So we decided to take a pic on our Prep Day with our game day shirts on! On Sunday, we had a really great sacrament meeting. Me and my companion got the opportunity to bless the sacrament in Spanish! We were really nervous and excited. So the night before we decided to prepare and practice saying the sacramental prayers in Spanish. So we felt pretty comfortable and confident so we set up the sacrament and we were ready. However, the mic in the sacrament table was broken so we had to use a portable mic. And since we used that mic, we also decided to read the prayer for the bread and water from the scriptures. So I blessed the bread and it went pretty well and it was a really cool experience. Then my companion blessed the water, and he did pretty well, but the branch president told us to say it again. So he did, and I helped him pronounce everything correctly. But, it still was not right! So we were like, what are we doing wrong? and the branch president came over and told us our mistake.. We forgot to change the word wine in the scriptures to water haha. So we ended up blessing wine 3 times, haha oops! So our district gave us a hard time about that and we had a good laugh. But even though it took us a while to get the prayer exactly right, it was still an awesome experience and the spirit was strong throughout the meeting. Another cool highlight from this week was talking to a guy named Roberto. So right next to our classroom they are redoing the landscaping and there are always a bunch of construction workers there throughout the day. So we talked to our zone leaders and they told us they had been talking with one of the workers and they handed him a Book of Mormon and bore there testimonies of the gospel to him! And we thought that was really cool, so we were like hey we should just strike up a conversation with one of these guys and practice our Spanish with them. So after planning our lesson, we looked outside our window and there was a guy fixing the piping next to our building. So we grabbed some chairs to stand on, opened the window and started taking to him haha! 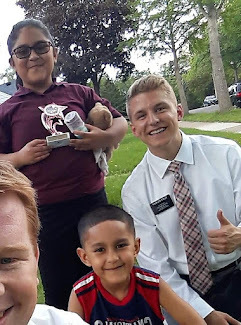 It was awesome, we talked about where we are from, our families, and our missions, and he was a really nice guy. So now we have a new goal of giving a Book of Mormon to a worker by the end of this week! I just want to thank everyone for all their love and support! I have been so blessed with amazing friends and family and I appreciate every single one of you!